Today marks the publication of the $100 Dungeons and Dragons Art and Arcana box-set, which contains a 400-page retrospective of the classic art of D&D, a reprint of the notoriously hard Tomb of Horrors module (designed by Gary Gygax to challenge the most overpowered characters), and frameable lithos. It's incredible. 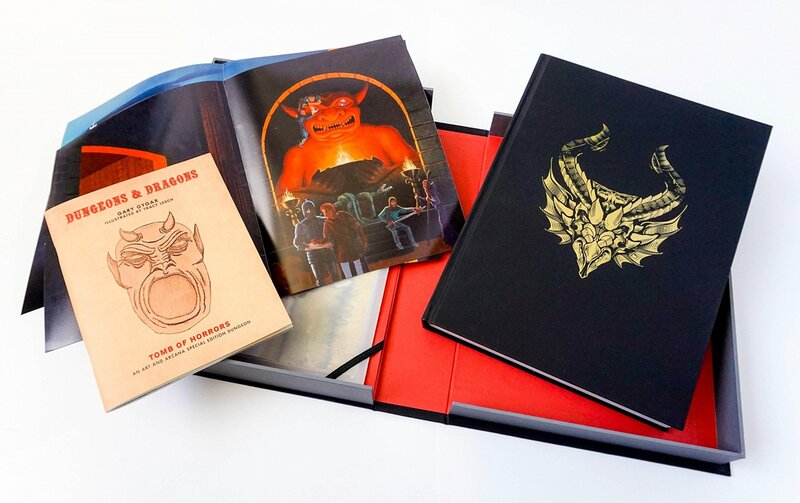 The book alone just consumed me for days, recalling the endless hours I spent poring over modules, rulebooks, supplements and the pages of Dragon magazine, losing myself in the visual art and the accompanying tables and narrative. Starting with Chainmail and moving all the way forward to the present moment, the retrospective of art, from pencil-sketches to 8-bit game art to line art to the covers of the classic rulebooks and novels. It's a visual history of one of the most seductive, captivating collections of art and design in US history, a set of works that lured a generation into a new narrative form. Combined with the other materials in the box, this thing is a gateway into another dimension.